This collection contains dark moral tales, historical fiction, sci-fi, comedy, fantasy, crime, memoir and surreal fiction. All the stories have been freshly-written and all are set in and around the UK’s only island city. No chocolate box visions and soppy princess in sight, the writers explore grown-up dilemmas, such as money problems, fear of rivalry in a relationship, floods, memories and changing bodies. Cover art and design by Jon Everitt. This book is available from Amazon worldwide as a kindle ebook. Available in hard copy soon. 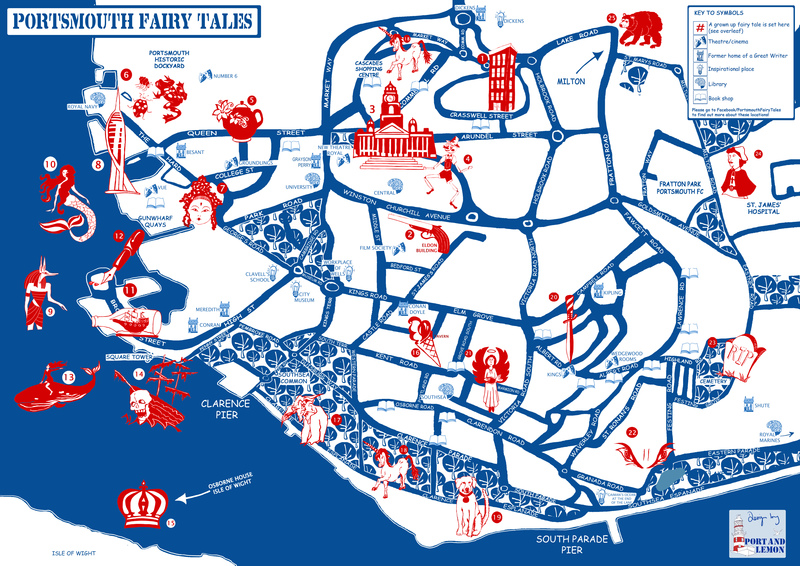 The Portsmouth Fairy Tales Promenade was launch in summer 2014 as part of Portsmouth Festivities. Creative writing workshops, literary map, readings and promenade were made possible thanks to support from Arts Council England. The paperback book is published by the boutique Portsmouth publisher Life is Amazing. And our ditty made from the outtakes of the doc!